Astrophotographer Mike Killian took this image of SpaceX's Falcon 9 rocket blasting off on May 6, 2016 from Cape Canaveral Air Force Station in Florida. SpaceX's Falcon 9 rocket appears to take its place among the stars in a stunning skywatcher image. 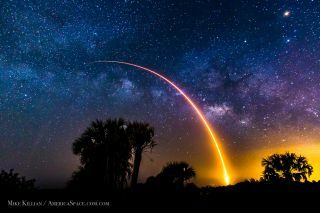 Astrophotographer Mike Killian took the photo on May 6 as the Falcon 9 launched the JCSAT-14 commercial communications satellite into orbit from Florida's Cape Canaveral Air Force Station. "I've waited years to try this shot," Killian, the managing editor of the website AmericaSpace.com, wrote in an email to Space.com. "Finally, all the conditions came together for an attempt." The Falcon 9 didn't speed off into the Milky Way that night, of course. Rather, the rocket's first stage came back to Earth, landing on the deck of a robotic SpaceX "drone ship," which was stationed in the Atlantic Ocean off the Florida coast. It was the second successful drone-ship landing in less than a month for SpaceX, which is working to develop fully and rapidly reusable launch vehicles. Killian's image is a double exposure, with one frame capturing the launch and the other the Milky Way. He used a Canon 6D at 24mm with ISO 3200 for the Milky Way, and ISO 200 F/14 @ 3:00 for the launch.